Spoiled with epic views over South Lombok coastline, Ashtari is a majestic Spanish styled “Masia” construction that features outdoor and indoor comfortable seating. At Horizon, the newly opened in house restaurant & lounge, the chilled interior offers a clear and natural atmosphere thanks to its pastel colors and delightful planters. The beach club style menu offers many sharing platters while our foreign chef offers Western and Indonesian specialties. When the sun hits the horizon it evolves into a bustling scene with weekly events. From sunrise to sunset, you can practice yoga surrounded by nature, follow traditional cooking classes and appreciate the rich organic items of the vegetable garden. You can even stay overnight and experience Ashtari Loft, a 100sqm comfortable seafront apartment with a 18sqm private terrace. Ashtari, a landmark in Lombok since 2006. 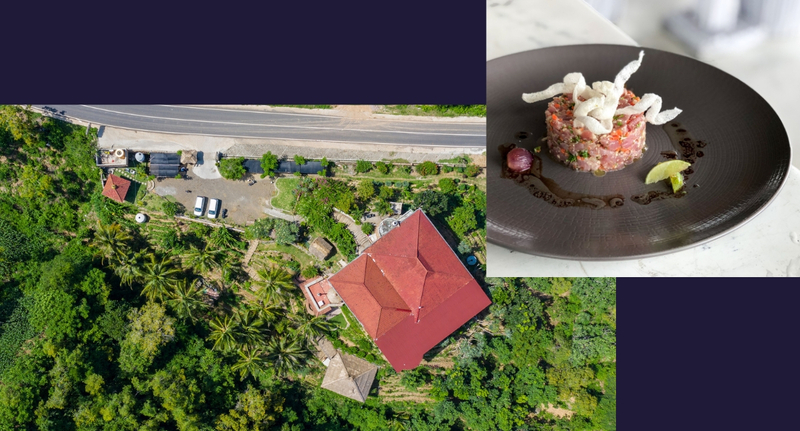 Chill & eat in our garden in the sky and enjoy the majestic views from the forest of Prabu to the surf breaks of Kuta and Gerupuk bays.